Find out all about American roulette game odds, bets and betting systems here: how to use them and whether they really work for gamblers. The importance of the role, which roulette wheel plays in roulette game, is emphasised with the fact that the term 'roulette' itself is translated from French as 'little wheel'. In some sense, a roulette wheel could be even considered as a decisive factor of which number would be winning in each game session. 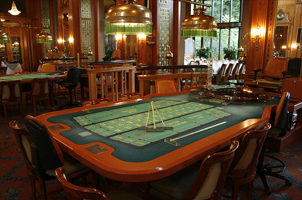 The second integral part of roulette equipment is a roulette table which is used for placing the chips according to the bets that players make. There are also roulette balls, which could be made of plastic, wood or even metal, and roulette rakes, which are used to collect the chips from the table and are applied mostly in European roulette. Generally, roulette wheels have 36 numbered and coloured in succession slots and one or two zero positions. It is important to distinguish between different types of wheels: mainly, there are American roulette wheel and European one. The latter kind of wheels is also often called a single zero wheel. They are designed in a very similar way with one important distinction: American wheel has one additional pocket for double zero position. At first sight this feature does not make a lot of difference between the games but if you look closer, then you could discover that European version of roulette is more profitable for players exactly due to the absence of 00 position. The sense is that an extra pocket in American game increases casino's house edge up to 5.26%. In European variation this value is about 2.67%, which automatically means that in this case the house's advantage over the players is less, so eventually they could get higher odds of roulette comparing to American variation's winnings assuming the same game outcome. Roulette table layout is served for placing chips by players in order to settle the roulette bets. It is designed as a rectangular table which contains two different areas. The first segment has 36 numbers on it, which are separated into 3 columns and 12 rows correspondingly. If players choose to make inside bets, they are to put their money on the table and ask a dealer to change them for special individually-coloured chips, which they further could place in such way as they stake. Here, gamblers could bet on one particular number or their combinations, such as straight up or street. The second segment is served for making outside bets, which are commonly considered as less risky, but offer lower payouts at the same time. This area is usually depicted on the long side of table layout and, in its turn, is divided into three boxes in order that players could stake on red or black colour, low or high, odd or even numbers. At the top of table layout there are one (in European roulette) or two zero positions (plus double zero slot in American version), which gamblers could also stake on.